Like most lizards, chameleons favor a warm habitat. For this reason, the geographical distribution of the chameleon is limited only to regions that enjoy a warm climate. However, this does not mean that all hot regions are natural homes to chameleons. Australia, North and South America have no native chameleons. The island of Madagascar is home to around 50 percent of the world’s chameleons. One hundred fifty species of chameleon inhabit the island, which has a diverse range of habitats, including desert and rainforest. Most of the island’s chameleons are forest floor dwellers, as opposed to arboreal. Since the chameleon is incapable of flight, Madagascar’s native chameleons are physically isolated from the rest of the world’s chameleon population. This means that they have evolved independently from other species. Africa’s mainland has the second largest distribution of chameleons in the world. In fact, contrary to popular myth, chameleons originate from the African mainland and not Madagascar, as scientific consensus previously asserted. Although mainland Africa has fewer species than Madagascar, DNA analysis has proven that the original chameleons evolved on the African continent and then found themselves isolated, possibly as a result of Madagascar breaking away from the mainland. Most chameleons live in forest habitats, but southwest Africa’s namaqua chameleon (Chamaeleo namaquensis) lives in the harsh, arid Namib Desert. The largest non-Madagascan chameleon is Meller’s chamelon (Trioceros melleri), which lives in east Africa and grows up to 50 cm in length. The Indian chameleon (Chamaeleo zeylanicus), despite its name, lives in Sri Lanka, parts of southern Asia and India. It is typical of most lizards, in that it prefers to live in trees, rather than on the forest floor. 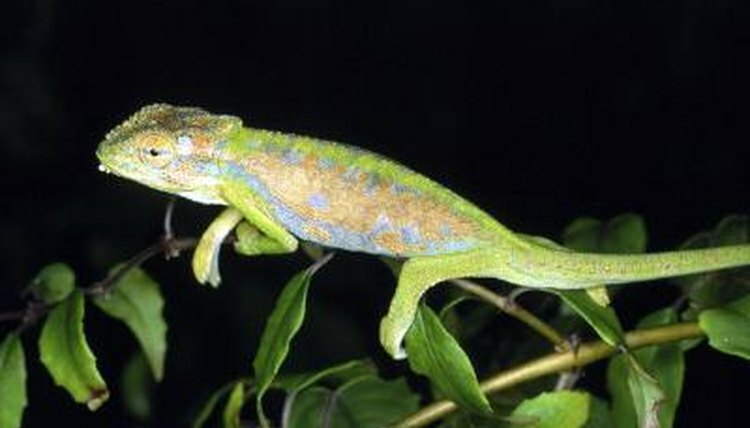 Europe’s only chameleon is the Mediterranean chameleon (Chamaeleo chamaeleon). He lives in Greece, Spain, Malta and Italy. Hawaii, California and Florida are home to a thriving population of feral lizards. These are the offspring of escaped or abandoned pets and due to the agreeable climates in each of these states, chameleons have managed to survive. As with all feral populations, they pose a risk to the local ecosystem as the native wildlife will not have evolved to protect themselves against this new threat. Berkeley University: Where Did All of Madagascar's Species Come From?